Whether you are renting a dumpster for the first time or have used dumpsters many times before you should be aware that not everything can be thrown away in a dumpster. Because of environmental, health and other concerns many companies and communities will not permit certain types of material in dumpsters. Some items will be accepted by certain dumpster providers and rejected by others. It is up to you to carefully read and review the list of items each company will or will not accept. In addition, some dumpster companies will permit certain items to be placed in their dumpsters for an additional fee. Appliances and mattresses are a couple of examples. Again, if you plan to dispose of one or more of these items please make sure to carefully review your provider’s policy and fees. If you are on a budget, dumpster-prohibited items can add expense and time to your project. Please read this list of Items Prohibited from a Dumpster to find out what is not allowed in a dumpster. While it is not entirely comprehensive, it includes the items that most companies do not accept. While dumpsters are great for discarding many types of debris there are certain items that are unacceptable to throw away. 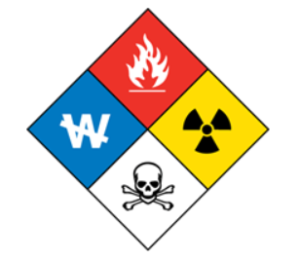 These include all flammable, toxic and hazardous materials. Please familiarize yourself with objects that may fall into these categories. Be aware of items with any of these symbols on their labels; they can generally be found on most chemical products like household cleaning solutions and aerosol sprays. Tires - Tires are capable of disrupting landfills by causing damage to the structure and equipment. Please dispose of tires with auto parts stores and municipal waste departments. Batteries - Car batteries are extremely hazardous due to high levels of lead and other heavy metals. These materials are very dangerous to mix with other forms of waste. A dead car battery can be recycled with an auto parts store or an authorized recycling center. Oils - Any oils used in a vehicle or as an industrial lubricant are prohibited. These oils are recyclable with household hazardous waste (HHW) facilities, auto shops, or other collection sites. Fuel - All types of fuel are forbidden by landfill sites. They are highly flammable and extra precautions need to be taken when disposing of them. Check for hazardous waste collection centers near you to ensure a safe disposal. Paint and Lacquers - Paints and lacquers may contain lead or mercury, especially if they are dated before 1990. Look for a recycling center near you to dispose of your cans. Hot Water Tanks - Hot water tanks can fill up with harmful gases inside a landfill so contact your city council to find a recycling program that accepts appliances such as these. Food Waste - We prohibit food waste in dumpsters to avoid spoilage and attracting vermin. Composting is a great option for discarding large quantities of food waste. Stumps - Tree stumps can cause damage to the lining of landfills so they are not allowed in dumpsters. See if your local recycling center accepts tree stumps to dispose of one properly. You can also rent a wood chipper or hire a landscaping company to remove it for you. Contaminated Soil and Absorbents - Contaminated soils and absorbents must be contained or treated in regard to the federal Superfund guidelines. Please note that these fees vary on a state and municipal level. Vendors will let you know whether these materials are accepted at the time of checkout. They will provide exact fees for any items not usually accepted. Mattresses and Box Springs - The EPA requires mattresses and box springs to be specially recycled. A fee of about $40 will be assessed for each mattress or box spring placed in a dumpster. Televisions - Not all vendors will allow these. If one of our vendors does not accept them, it will be stated on the cart page. A fee of about $55 will be assessed for each. Appliances - Some vendors will accept these without an extra fee. Check the terms and conditions at checkout for exact pricing. When disposing of electronics, pharmaceuticals, or refrigerators, check with your local sanitation department; your city or town’s recycling programs usually make disposing of these items easy and free of charge. Do you have questions about what might be prohibited? Contact us today for more information! Need help determining the what dumpster is right for you?